When you think of quintessential comfort foods, meatballs should rank high on the list. At their finest, meatballs are golden brown on the outside, moist on the inside and blanketed in a hearty ragout sauce – a simple yet powerful delight that has sadly been a rarity in Hong Kong. 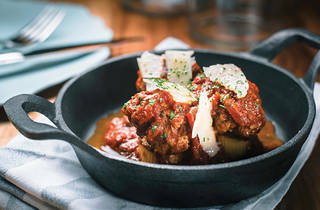 NOM, the city’s first meatball specialist, is looking to change that, with its eight-variety deep menu, ranging from your traditional beef to its innovative seafood mixture. But just to be clear, NOM aka Not Only Meatballs, the brainchild of restaurateur Ricky Cheuk of Ramen Jo and Via Tokyo fame and former Goccia chef Fabrizio Napolitano, also offers up a menu of pastas, pizzas and an à la carte selection of scrumptious Italian delights. They take their drinks pretty seriously as well, with the spacious and rustic bar offering up biodynamic wines and original cocktails like the hibiscus Bellini. 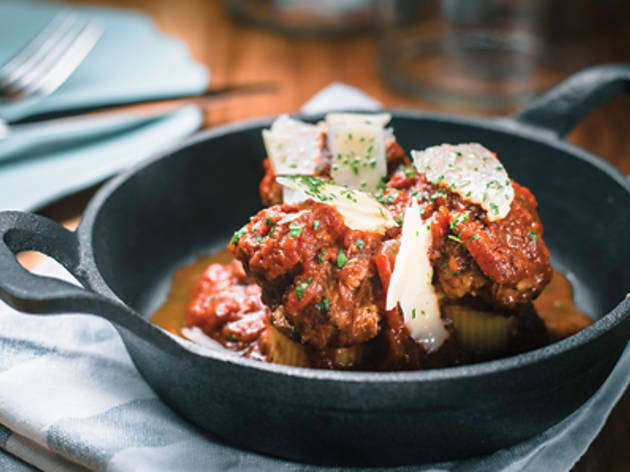 We step into the invitingly laid back, loft-like space, which boasts an Italian-influenced décor, with chequered floors, earthy, aged wood furniture and warm brass detailing on the walls and fixtures and plump straight for a variety of meatballs. The chicken meatballs ($68) served, like the entire range of meatballs, in threes on a mini skillet, are bathed in parmesan fondue on top of a bed of julienned asparagus with hazelnut and dill seasoning. The dish is presented beautifully, but unfortunately the balls are dry and cold in the centre. It’s also on the salty side and the distinct hazelnut flavour overpowers the dish. Next up, the tried-and-true beef meatballs ($78), placed on top of a piece of paccheri pasta, accented with parmesan cheese and drenched in Neapolitan ragout. The flavour of the ragout is rich, hearty and full of tomato flavour, but unfortunately, yet again, the meatballs are not cooked evenly and have a tepid centre. The seafood meatballs ($118), comprising of shrimp and fish however, prove to be a different story. The tasty, briny flavour of the shrimp shines through and there is finally enough moisture for a pleasing bite. The sauce, a cioppino-esque stew with mussels and clams, adds a pleasing extra layer and gives the dish a rounded and balanced seafood flavour. But we’re not just here for the meatballs. For mains, we start with the squid ink taglliatelle ($198) that’s mixed with sea urchin, nail squid and hazelnuts. The pasta is slightly undercooked, missing the al dente mark, while the flavour of sea urchin is completely absent and the hazelnut notes prove slightly confusing and discordant. For pizzas, we go for the black truffle and wild mushroom ($218), which also comes with fennel sausage embedded into the layer of taleggio cheese. Again, we find ourselves underwhelmed – the truffle is overpowering, the crust tends towards soggy and the overall flavour too salty. The saving grace of the meal is the Iberico lamb ($270) served with crispy potato chips and a delightfully creamy pumpkin purée. The meat is supple and tender and, from first bite, the delectable, subtle and elegant flavours of the lamb shine through. This is a dish to salivate over. To finish things off, we opt for the lemon tart ($98), which comes with a refreshing cardamom gelato. The tart is full of zesty lemon flavour and has a nice balance of sweetness. The contrast from the gelato is sure to satisfy one’s creamy and crunchy craving. NOM 5 Elgin St, Central, 2540 7988; nom.com.hk.